Affine: uses the so-called atop compositing operator. Composite, Composite & Transform, Cairo (Affine) Blend: uses the over compositing operator instead. So what does these atop and over really mean? Let’s discover what these compositing operators do using a typical title and semi-transparent background example. For simplicity, we first will ignore the Opacity parameter of the aforementioned transitions to keep things easier to grasp. And after we’ve mastered this step, we will finally look at how the opacity parameter fits into the full picture. The result of the atop compositing is best explained at first by showing its outcome: Text from the topmost title clip (partly) vanishes in those regions where the underlying clip on the middle track is (semi) transparent. The checkerboard clip on the bottom track just serves for illustrational purposes, so we can better see the transparent regions. Please notice how the two Affine transitions are chained: first, the upper Affine composes the title clip onto the gradient background. Then, the lower Affine composes the result onto the checkboard background. But how does the Affine transition exactly handle transparency? Let’s look at this hand-made illustration, where we have two pixels with some transparency each (the alpha values, αAand αB). It’s important to not confuse pixel transparency with the opaque parameter of transitions. Our red pixel comes from the upper track frame (B), whereas the green pixel stems from the lower track frame (A). An alpha of 0 means a completely transparent pixel, whereas an alpha of 1.0 (or 255) means totally opaque pixel. The Affine transition now simply ignores the transparency information from the upper frame pixel (the red one). And that’s the explanation why in our example above the title text vanishes in those regions where the middle clip is transparent. Again, we basically use the same setup as before, but this time we use Composite & Transform in place of Affine transitions. We chain the transitions as before, so that the lower transition works on the outcome of the upper transition. But look! The outcome is different! The result of the over operator is probably more to the expectations of most users. Now, the top title clip doesn’t get (sorry) clipped anymore. As the over operation produces results more to the expectations of many users, how does it handle transparency exactly? Simply spoken: if you paint some semi-transparent pixel over another semi-transparent pixel, then the result will be less transparent. It will be even less transparent than the lower frame pixel transparency. This is what we would probably expect from painting with semi-opaque paint. Calculating the resulting transparency for two given pixels from an upper frame (B) and a lower frame (A) is thus more involved this time. Again, we start with the transparency of the lower frame pixel (green) as a base. But this time, we can’t ignore the transparency of the (red) upper frame pixel. But simply adding both transparencies wouldn’t yield sensible results; what does a transparency of 2.0 or 511 mean? The dynamic compositing transitions also feature a parameter called Opacity. It’s easy to confuse it with pixel transparency, but it’s something different. The opacity parameter applies to the upper frames (B) only. It is kind of a master control … but how does it work? Let’s start with the Affine transition, again. Above, we’ve seen that Affine ignores the transparency of the (red) upper frame pixels. And Affine also ignores the Opacity parameter when calculating the result pixel transparency. Instead, the Opacity parameter influences how the result pixel color gets calculated: this is a linear interpolation between the color of the upper frame (B) pixel and the lower frame (A) pixel. The Opacity now controls the exact blending point. An opacity of 0.0 results in only the lower frame (B) pixel color, while 1.0 solely yields the upper frame pixel (A) color. 0.5 would be halfway between the two pixel colors. 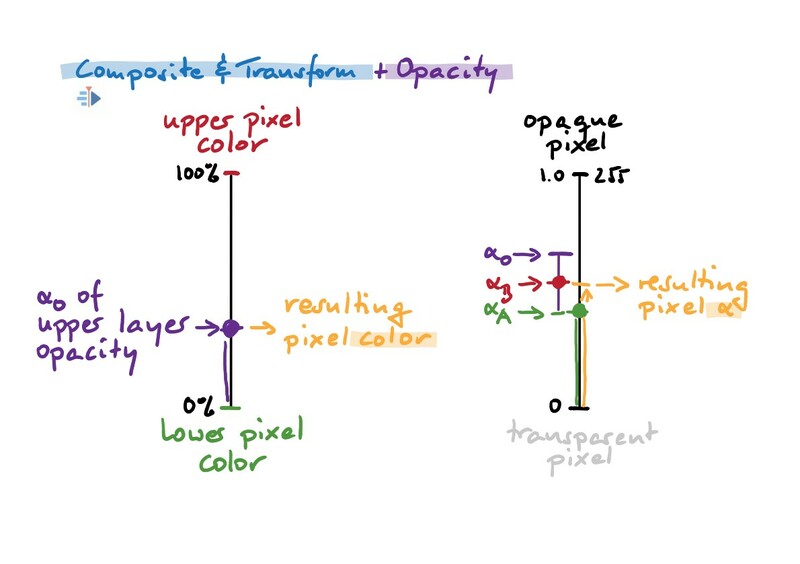 To sum up: in case of the Affine transition, the Opacity parameter solely affects color blending between upper frame (B) and lower frame (A) pixels. 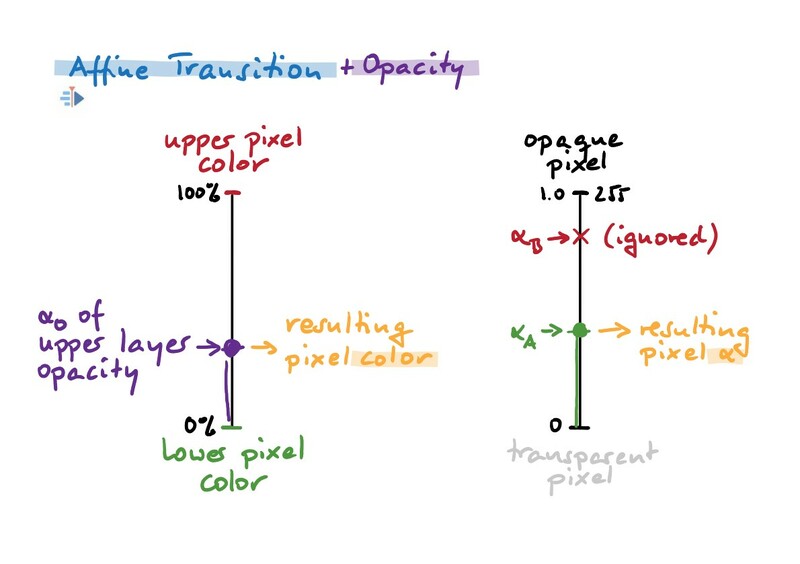 Next, let’s look at the other transitions: Composite & Co.
As for the color blending, the same procedure applies that we’ve just seen with the Affine transition: the Opacity parameter controls how much upper frame (B) pixel color gets into the blend. But when we look at how the transparency of the resulting pixel gets calculated, things are starting to look different. 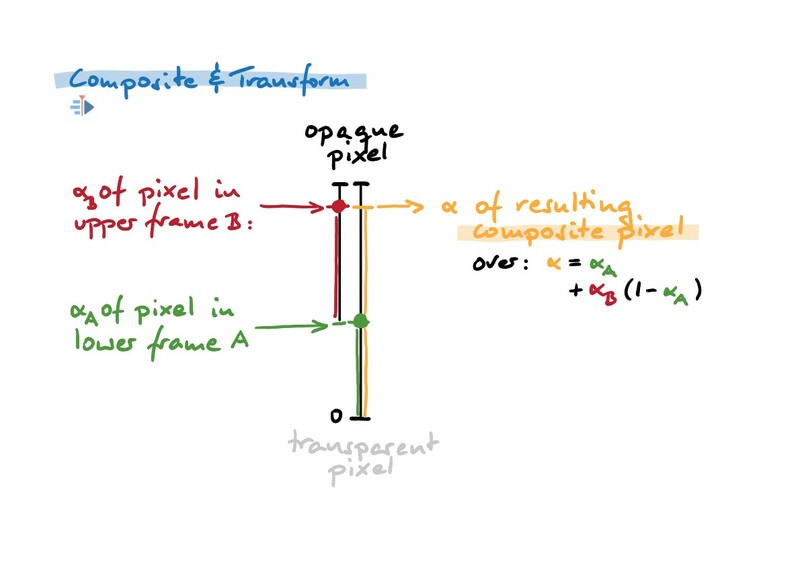 We’ve seen that the transparency of the upper frame (B) pixel gets scaled down in reverse proportion of the lower frame (A) pixel transparency. The Opacity parameter takes this even further: it additionally scales down the upper frame (B) pixel transparency. Please see also the illustration. In consequence, the Opacity parameter thus controls how much opacity of an upper frame (B) pixel is applied at all. This way, you can fade in or out the upper frame. 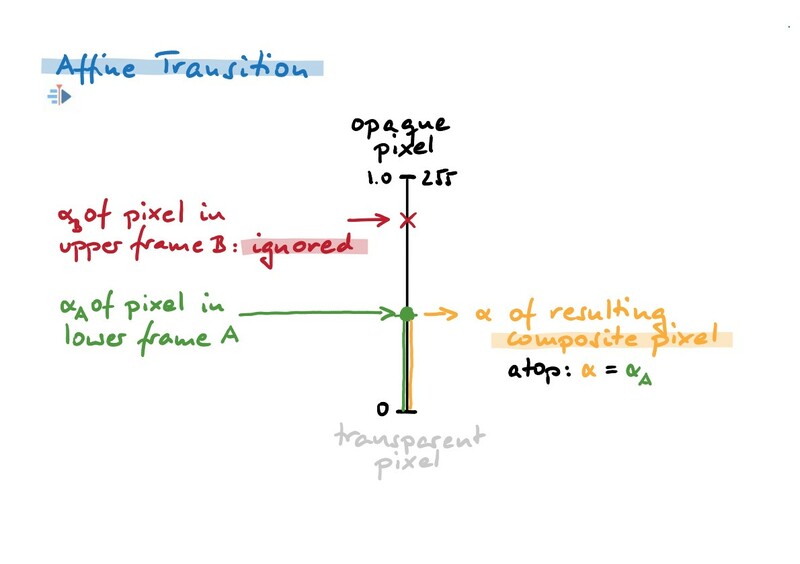 To sum up: in case of the Composite (&Co) transitions, the Opacity parameter affects both color blending of upper frame (B) and lower frame (A) pixels, as well as transparency of the upper frame (B). Wikipedia article on alpha compositing, with a reference to the original Porter Duff SIGGRAPH’84 paper on «Compositing Digital Images».